Des Moines - The Iowa Barnstormers (0-1) remain on the road as they take on the Arizona Rattlers (0-1) on Sunday, February 26, 2017. Kickoff is set for 4:00 p.m. CST at the Talking Stick Resort Arena. Fans will have the opportunity to stream the game live on YouTube. 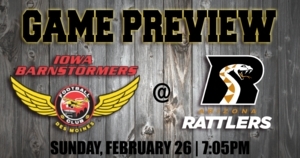 The Barnstormers will look for its first win of the season as they travel to face the Rattlers on February 26. The Rattlers will also be looking for its first win of the season after losing to the Sioux Falls Storm last Friday. The Iowa Barnstormers lost a back and forth game to start its third season in the Indoor Football League (IFL) losing to the Wichita Falls Nighthawks 68-53 last Saturday. Quarterback Travis Partridge threw for six touchdowns and also ran a short score. Wide Receiver Brady Roland was on the receiving end of three of those touchdowns, while Linebacker Javicz Jones had a team high 10 total tackles for the Iowa defense. The Arizona Rattlers fell to the Sioux Falls Storm in its IFL debut last Friday. Arizona was held scoreless during the first quarter, but Rattlers' Darrell Monroe opened things up with a touchdown run early in the second quarter. Both teams traded scores throughout the second half, but the Rattlers' defense could not hold up as Sioux Falls continued to pound the ball and used two fourth quarter touchdowns to take the lead. Arizona's offense was led by receiver Anthony Amos who caught two touchdowns in the game. The Barnstormers will return to Wells Fargo Arena on Sunday, March 26, 2017 for the home opener against the Cedar Rapids Titans. Kickoff is set for 3:05 p.m. Tickets are available at the Iowa Barnstormers official website. Season tickets also remain on sale. For more information, call the Iowa Barnstormers front office at 515-633-2255 or visit www.theiowabarnstormers.com.